Android Lollipop’s most notable improvement to the setup process is the ability to restore your device from a specific backup. Rather than automatically downloading every app and setting affiliated with your Google profile, Lollipop now allows you to restore from a particular device’s profile. Simply choose your backup profile, and you can handpick the apps associated with that profile that you want to load to your updated device. This new feature is particularly handy for those who use multiple Android devices, enabling them to keep separate sets of apps on each device. Lollipop introduces a complete and aptly named visual overhaul of the Android UI: Material Design. Google’s reimagined look and feel for Android is more vibrant, fluid, and cohesive than in previous versions. The impact of Material Design can be felt throughout the entire OS, from its new navigational buttons and reimagined menus all the way to Google’s portfolio of stock apps. Thanks to this new unified aesthetic, everything about the new Android looks and feels like it fits together seamlessly. Lollipop's Material Design makes the Android experience more intuitive. Tap and flick your way around Android Lollipop, and you’ll quickly see that the “surfaces and edges” with “seams and shadows” approach does in fact readily reveal what can be touched to trigger actions, as Matias Duarte, Google’s vice president of design and lead architect of Material Design, said at this year’s Google I/O. This translates into richer, more colorful apps with vibrant transitional animations and visual cues that make navigation more intuitive. It also means a shallower OS, ditching the deep, often confusing menus and rabbit holes of Android’s past and placing more of what you need at the surface. Google’s Material Design guidelines give developers the tools to create a unified experience across device sizes. It’s true that the Android tablet experience is in some measure that of an enlarged phone, as some have suggested, but it is clear that Google aims to improve this based on Lollipop’s developer guidelines. This emphasis on uniformity is also in evidence in Google’s simultaneous rollout of the Nexus 6 smartphone and the Nexus 9 tablet, enabling developers to target the latest smartphone and tablet at the same time. Material Design should extend that unified experience to wearables and beyond. For a tour of Lollipop’s new Material Design, check out our first look at Android’s fresh new face. 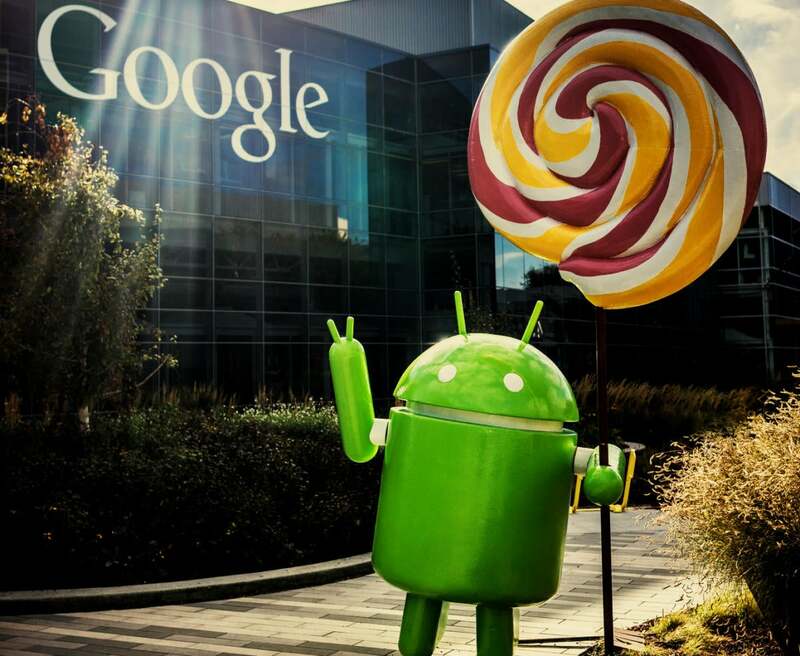 Some of Lollipop’s most notable improvements can be found among Android’s central elements: its lock screen, notifications bar, and app drawer. Android’s new lock screen provides a quick view of unread notifications, which can be swiped down to reveal more content, double-tapped to open, or simply swiped away. You can control which notifications, if any, that you would like to be displayed on the lock screen by navigating to the Sounds and Notifications settings. And if your device is locked with a PIN or password, you can choose to show only the top line of a notification instead of its sensitive content (defined by either the user or the app developer). As in previous versions, the lock screen also provides direct access to the notifications bar, camera, and the device’s various user profiles (more on that in a bit). Lollipop’s notifications bar can now be swiped down once for a top-line view of your notifications and pertinent Google Now cards or swiped down twice (alternatively, with two fingers rather than one) to reveal Wi-Fi, Bluetooth, and location settings, along with toggles for airplane mode, rotation lock, and a flashlight. The notifications bar also contains a slider to control your display’s brightness and a one-touch button to “cast” (aka share) your screen with any compatible device (such as Chromecast) on the same Wi-Fi network. In addition, the bar provides access to your device’s full settings menu and user profiles. Lollipop offers several Notifications enhancements to ease your ability to keep on top of important updates. Notifications have undergone a significant overhaul. 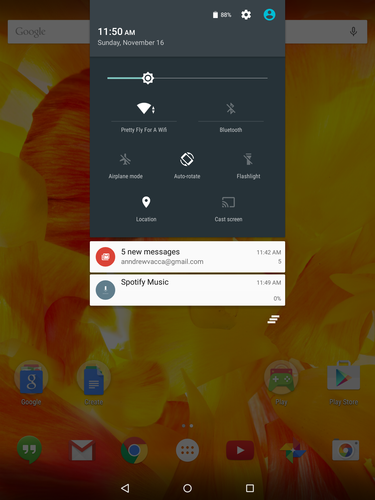 Android Lollipop now prioritizes notifications based on what you will likely find most important. These prioritized notifications always find their way to the top of the list, surpassing chronological order in both the notifications bar and on the lock screen. Lollipop also introduces heads-up notifications -- visual “cards” that appear at the top of your screen for certain real-time alerts that you can chose to interact with or file away for later. You can also now manage which and when notifications appear through your device’s volume menu: quickly toggle between displaying all notifications, priority notifications, or no notifications at all. Alternately, dive deeper to program specific times to display all information and other times to display only certain information. 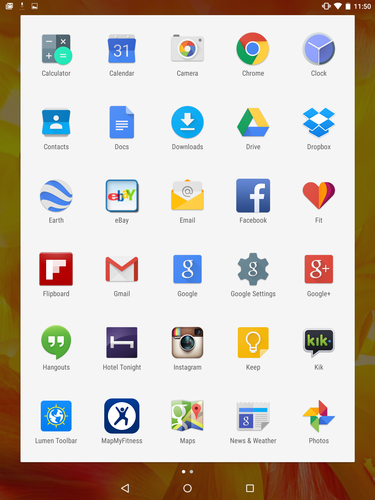 The new and improved app drawer feels more connected to the overall Android experience. Finally, Android’s app drawer has been given a fresh coat of paint for the first time since Android 4.0 Ice Cream Sandwich, so it seems more connected to your home screen, with a folderlike look and feel, rather than spun off as an entirely separate area of the OS. The app drawer is brighter, offering a white background rather than a black or transparent one, and it is now limited to apps, with access to widgets restricted to a long press on your home screen. Google invented mobile multitasking as we know it. With Android Lollipop, it has pushed the concept further via Lollipop’s new Recents window, which provides access to nearly all your apps rather than a handful of recently used ones, and is now arranged in cards similar to those found within Google Now. These cards scroll through a Rolodex-like motion, providing a shrunken view of your multiple apps and windows. 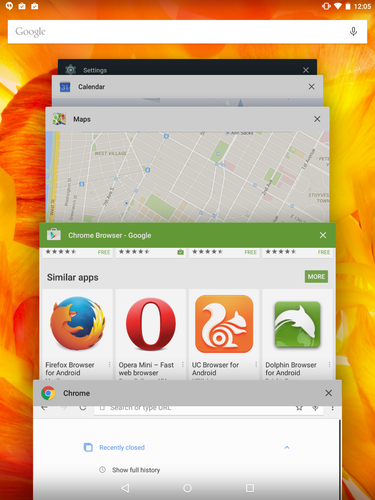 Lollipop's overhauled Recents takes mobile multitasking to a new level. 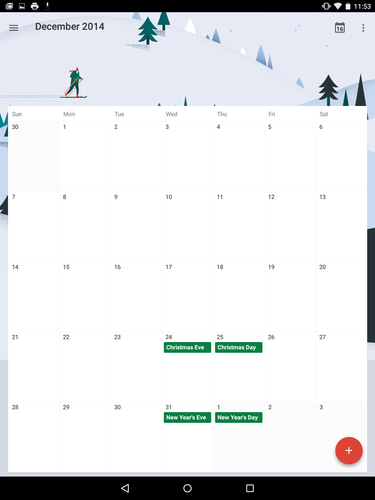 The Recents UI goes deeper than Android’s previous multitasking solutions, giving you the ability to not only toggle between windows, but also between windows within windows. Suppose you’re composing a message within Gmail; click the Recents button and you’ll be able to access not only other apps but other aspects of Gmail, such as your inbox. It works for Chrome, too, allowing you to toggle between open tabs through the multitasking menu. The ability to toggle both between and within apps provides an entirely new way to jump from one point to another within Android, drastically cutting back on the amount of times you’ll click the Back button throughout the UI. An Owner account has access to the entire device and everything within it, as well as control over other profiles on the device. A User account, on the other hand, has limited access to certain apps and content controlled by the device’s main user, as well as limited calling and SMS capabilities. A User account can, however, download his or her own apps and customize certain settings that remain limited to that profile. Finally, there’s a Guest profile, which provides access to the core functions of your phone or tablet, including calling, messaging, and core Google apps. Guests can access their Google profiles to sync contacts and even purchased apps, but all information is limited to one session and is wiped upon exiting Guest mode. This is useful for those times that you want to lend someone your phone but don’t want them poking around your own personal messages, photos, call history, or other sensitive information. In the same vein, you can now “pin” your screen, restricting access to a sole app, window, or piece of content you want to share, thereby preventing your guest from navigating away from the pinned element to anything else on you device. Whereas Dalvik compiled and processed apps each time they were opened, ART performs ahead-of-time processing, translating an app’s source code on initial installation. The result, Google claims, is device performance of up to four times than that of previous versions with smoother, more visually rich applications that open and operate more efficiently. This performance boost was noticeable on my Nexus 5 at the outset. As you begin to use Android Lollipop, you will certainly realize that navigating the OS, transitional animations, and app switching is far smoother than before. Android Lollipop is also the first version with 64-bit support, which Google claims will bring desktop-class CPU performance to the OS. Android’s core applications, including Chrome, Gmail, and Play Music, are now 64-bit-native, as is the Java engine that many third-party applications are built on. The difference won’t likely be felt by users immediately, as nearly all apps are still 32-bit, but it will allow hardware makers to incorporate more powerful yet efficient processors, GPUs, and RAM into the next generation of smartphones and tablets. Behind the scenes, Project Volta’s Job Scheduler API batches battery-intensive tasks and schedules them for optimal times. Instead of completing each background task immediately, Android can now put off certain functions until a device is connected to Wi-Fi or a charger, thus reducing the number of times the OS draws power from the battery. Project Volta also provides developers access to a battery historian, which illustrates how and when apps use voltage, as well as how efficiently they’re doing so.